Taking care of your lips is as important as taking care of your skin, and other body parts. We sometimes give importance to the lips only by hydrating them, but have you ever wondered about the dead skin present on them? Always remember, Exfoliating your lips is very essential part of the skin and beauty care regime it makes lips soft, supple and plump too. Homemade lip scrub is also a good solution for exfoliating lips. To exfoliate your lips you don’t have to spend much money on the expensive lip scrubs available in the market. You just have to do one thing and that is to go in the kitchen and look for some ingredients and make your own homemade lip scrub. 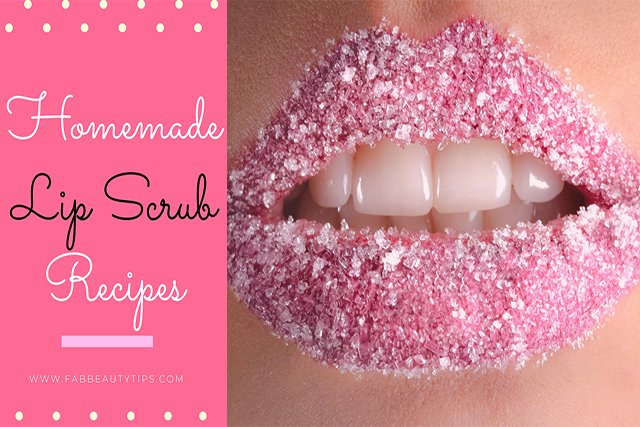 We are sharing some recipes for making homemade lip scrub that will help you to get perfect lips. In a bowl add honey and coconut oil. Mix them well and apply this on the lips. Gently start scrubbing your lips in circular motion. Do this for 2-3 minutes. Keep it for another 2 minutes and rinse with water. Honey and coconut are two best ingredients to exfoliate the lips and to moisturize them at the same time. Mash the mint leaves and add sugar in it. Add coconut oil and mix them well. Apply this on the lips and scrub it. Sugar works as a great exfoliator while mint helps to stimulate the circulation. It is very soothing and gives the feel of fuller lips. Mix honey and Brown sugar in a bowl and apply them on the lips. Scrub it for 2 minutes and rinse with water. Honey helps to lighten the dark lips and brown sugar helps it to work properly and gives plumper lips. Take the chocolate powder and sugar. Add few drops of almond oil in it and give it a nice mix. Apply this on the lips and scrub them. Do this for 2-3 minutes and rinse your lips with water. This chocolate lip scrub moisturize your lips as well as exfoliate them with gentle care. This also make your lips lighter in colour. Apply this on your lips and scrub it. Cinnamon is a natural lip plumper. This also exfoliate them and make them soft, supple and pink. Mix them well and apply it on the lips. Now, gently scrub your lips for 2-3 minutes. Keep it for 2 minutes and wash it off with water. Orange peel is a great way to treat dark and discolored lips, whereas almond oil nourishes them. Mix all the ingredients and do scrub your lips with this. Do this for 2-3 minutes and leave it for 2 minutes. Rinse your lips with water. Almond oil helps to rejuvenate the dead skin and prevent further chapping of lips. It nourishes the lips from deep and make them lighter. Take some amount and scrub your lips. Rinse your lips with cool water. Coffee makes your skin look healthy and plump. And when used in a lip scrub it works great. It exfoliates, treats dark lips and makes them lighter too. Mix coconut oil and sugar. Add vanilla extract to it. Mix them well and scrub your lips with this. Coconut oil treat the chapped lips and nourish them, whereas vanilla extract soothes the burn. Mix all the above mentioned ingredients in a bowl. Apply this on your lips and gently scrub them for 2-3 minutes. Keep it for another 2 minutes on your lips. Vitamin E is a natural moisturizer and antioxidant. It treat chapped and dry lips instantly. Vitamin E oil has many benefits for skin, hair and health. In a bowl take sea salt, add coconut oil and lavender oil. Mix them well and apply on your lips. Scrub your lips gently for 2-3 minutes. Sea salt is a great exfoliator and coconut oil moisturize the lips. This will give you rosy pink lips in no time. Mix Shea butter and sugar. Take some amount of this scrub and start scrubbing your lips. Do this for 2-3 minutes and leave it for another 2 minutes. Shea butter is very good for moisturizing the lips and treating the dry lip. Sugar mixed with Shea butter works as a nourishing scrub. Mash the strawberries with a fork. Add sugar and honey in it. Scrub your lips with this for 2 minutes. Strawberry lip scrub is an easy way to treat dark and dry lips in a minute. It make your lips look pink and fuller. Crush some rose petals in a bowl and add milk in this. Take this and scrub your lips with gentle circular motion. Do this for 2-3 minutes. Leave it on for 5 minutes. Rose petals is very gentle on the skin and they remove dead skin and chapped area with nourishment. Milk make a good way to nourish them. Mix lemon juice and petroleum jelly. Now add sugar in it and give it a nice mix. Take some amount and apply on the lips. Scrub them for 2 minutes. Lemon is used for lightning the dark skin and this homemade lip scrub works great to get plumper lips while removing the dead skin. Mash the apple and add remaining ingredients in it. Apply this on the lips and scrub them for 2-3 minutes. Keep it for another 2 minutes. These two things proven to be the best homemade lip scrub as they nourish and remove dry and dark skin from the lips without any irritation. These homemade lip scrub are natural and would not do any harm to the lips. They make your lips look pink and fuller with no such expensive treatments. So, give them a try and get rid of the chapped and dark lips.